Jack Edmondson's Media Blog: Evaulation Q2: How effective is the combination of your main product and ancillary texts? Here is our music video. Here is the outside panel of my digipak album cover. Here is the inside panel of my digipak album cover. Here is a link to my artist's website. Please click on the image below to enter the website. Evaulation Q2: How effective is the combination of your main product and ancillary texts? As a record label, our aim was to create a promotional package with consistent and recognisable branding for our up and coming artist to generate interest within our audience to buy into the brand. 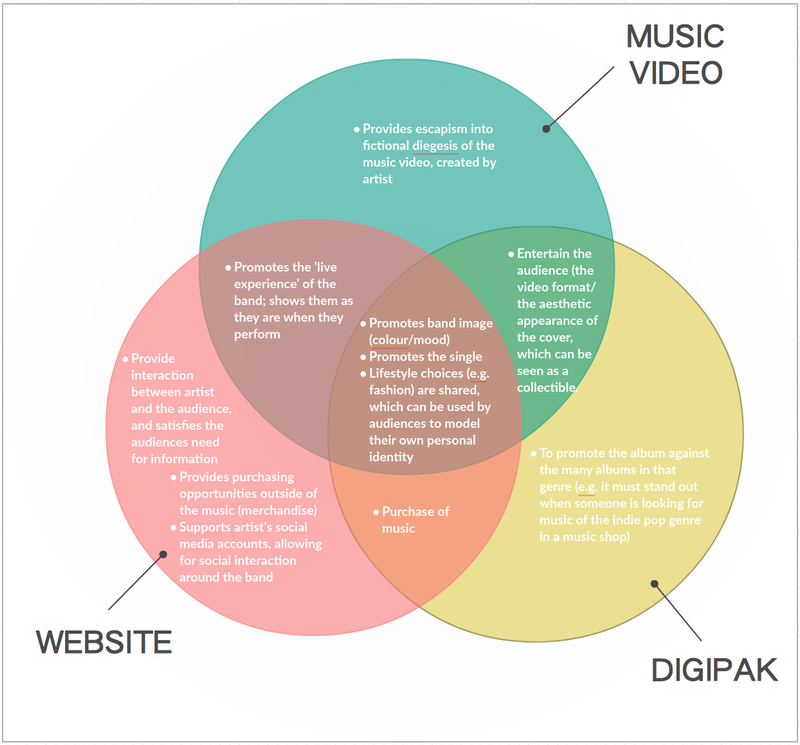 Although our main text - the music video for the artist's single - and our ancillary texts - the digipak album cover and the artist's website - all have their own identity and specific functions, the combination of the three has the effect of creating a clear brand for the artist, promoting the brand and selling the product - the music - to the audience. In this answer, I will be using a case study to demonstrate how we've researched an existing marketing strategy and how that has influenced our decisions when marketing The Acrylics. The band I will be studying closely will be Echosmith, an indie pop band. The music video, album cover and website each have their own independent functions. Some of these functions are shared with another product or across all three, as can be observed in the Venn diagram below. The way these functions are carried out are also independent to each product. For example, the brand of the artist will be covered through the music video in performances and CU's of the artist's facial expressions. The same information will be conveyed on our album cover and website through colour scheme and the style of font used. Blumler and Katz's Uses and Gratifications Theory outlines the audience's needs when consuming media products. These include escapism into an entertaining media landscape that the artist creates through the branding, information about the music artist, and help in the construction of personal identity (e.g. fashion and personal values). The functions of each product appeals to the demands of the audience. Before we made any decisions on how we would market our band, we researched marketing ideas and the many theories surrounding marketing and star construction. Here are some the first questions we answered when thinking about the marketing of our three products. Marketing Theories outline four things that need to be considered when marketing a product. These things are key to understanding the audience: how they will locate and respond to the product, and which circumstances are the best for them to spend their money. In the presentation below, I will outline what these four considerations (or '4 P's') are. Please watch my presentation below to find out more. Use the arrows on either side of the presentation to navigate between slides and scroll to zoom in. 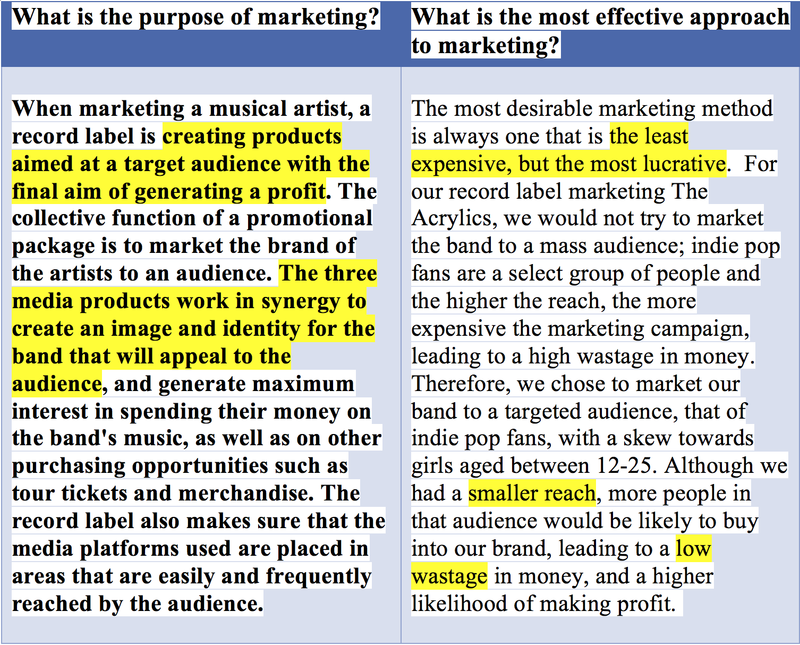 To help us understand the choices we should make when marketing our band, we examined the marketing campaign of the indie pop band Echosmith. In the presentation below, I will analyse the key aspects of the band's star identity, their marketing campaign and how I believe it was effective. Please read my presentation below to find out more. Navigate the presentation using the scrollers seen on the right and bottom of the screen. 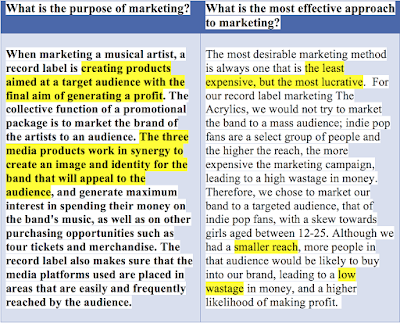 In the presentation below, I will outline how marketing theory and research into our case study have influenced the marketing of our own band. Richard Dyer was a theorist who was interested in the construction of the 'pop star'. He stated that the identity and persona of a pop star is part of the product a record label will sell the audience. He also stated that a star's identity also exists outside of their music; their identity must be repeated with the look of their other products, such as their merchandise, their website and their album cover, In the video I have created below, I will go into more detail about Richard Dyer's star theory and outline how a pop performer's identity is constructed into that of a pop star. Please watch my animated video below to learn more. Simply press play on the video to start the presentation, and click the pause button if you need more time to read the information provided. In the presentation below, I will analyse how our case study, Echosmith, incorporates star theory into their branding, how we produced our own star identity for our band, and how I believe we were effective. Overall, I believe that the combination of our products throughout our marketing campaign for very effective in reaching and appealing to our audience with our artist's brand. The music video, album cover and website had successful connectivity to generate interest in our band and convince our target audience to buy our artist's music and various other branded products. Eyup. My name is Jack and this is my Media Coursework Blog. I am a big fan of film, theatre and television. I like to vent my frustration on terrible movies, books and shows. I am currently studying Media, Drama, and Sociology. I am a member of Group 3, along with Noa Craig (Candidate No. 9205) and Emilio Francischelli (Candidate No. 9225). Together, we have completed Brief 2: Music Industry. To see my portfolio evidence, please use the labels on the right of my blog: A2 Research and Planning, A2 Construction and A2 Evaluation.